The glow-switch starter was invented by E C Dench in 1938 [US Pat. No, 2200443]. It is a small discharge tube containing a bimetallic switch, arranged so that the heat from the glow discharge causes the tube to short itself out. The Dench lamp-control circuit is shown below; the only differences between it and the modern arrangement being that the glow-switch has been simplified for manufacturing and has an interference-suppression capacitor connected across it. The fluorescent tube is a column-discharge mercury vapour lamp with pre-heatable thermionic cathodes. In addition to mercury vapour, the tube is also filled with a noble carrier gas, usually argon, which lowers the strike voltage and increases electrode life. When the lamp is switched-on initially, the starter-switch strikes briefly and then closes. The cathode filaments are then placed in series with the ballast and start to glow. The starter meanwhile cools down and re-opens. This event, although randomly timed relative to the power-line waveform, has a fair probability of causing a high-voltage pulse as the magnetic field in the ballast choke collapses. If the timing is right, the Hg-discharge initiates. If not, the glow-switch re-strikes and the cycle repeats. Once the lamp is running, the voltage across it is normally too low to allow the starter-switch to strike. 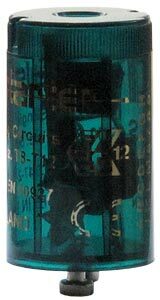 The switch-tube needs to have a striking voltage lower than the mains peak voltage, and a running voltage lower than that of the Hg discharge tube. This situation is engineered, firstly by judicious choice of fill-gas and pressure, but particularly because the lamp has thermionic oxide-coated cathodes. Thus the glow-switch is completely de-activated and uses no energy once it has done its job. That will only be true however, if the oxide coatings on the lamp cathodes are still present. Once the lamp has worn out (the cathode has been stripped by sputtering), its operating voltage rises and the glow-switch will tend to re-strike randomly during lamp operation, causing endless flickering. A temporary solution is to remove the glow-switch once the tube has started, but the light output will become increasingly feeble, conduction may become uni-directional as one cathode fails before the other (causing noticeable strobing), and eventually the lamp will refuse to start. To obtain a high running voltage, the switch tube has no cathode coating, and it is operated in the anomalous conduction region, i.e., the point in the glow discharge regime at which the entire available cathode surface is involved (the electrode area is deliberately made small). The requirement that it will strike at less than the mains peak voltage however requires a Penning mixture in the bulb. It is also advantageous that the tube should quench rapidly, so that it will enter its quiescent state reliably, for which reason hydrogen is often used as one of the fill gases. According to the Osram Technical Guide, the filling (in modern starters) is typically a mixture of noble gas (Ne, Ar, or He) with H2 at a pressure or 20 mbar to 100 mbar. Note that the starter switch has a small electrode spacing, and so the visible light output is actually a cathode glow. This is not necessarily representative of the glow that will be seen in the positive column of a long tube using the same gas mixture. To see the bulk gas discharge however, we can place the tube in a strong RF electric field [see: coil resonance experiments]. Left: modern glow switch with DC excitation. The glow colour is characteristic of argon. Right: the same switch with RF field excitatation at about 25 MHz (both electrodes grounded). The glow colour is characteristic of hydrogen. The fill gas is probably Ar + H2 . The opening of the switch occurs randomly in relation to the AC supply waveform. Thus the control-circuit often fails to produce a large-enough high-voltage pulse from the ballast inductor, and has to try again. When a good high-voltage pulse is produced, it is clipped by re-striking of the glow-discharge in the switch-tube. When the lamp is worn out, the switch-tube attempts to start it indefinitely (overheating the ballast choke and eventually destroying itself). With these limitations in mind, it is not difficult to concieve of an electronic replacement for the glow switch (also designed for retro-fitting into existing equipment); which opens near the peak of the AC waveform (or opens several times per half-cycle), does not clip the starting pulse, and limits the number starting attempts. Such starters exist and, being solid-state devices, also have unlimited life. Tabelek LEL: Multipulse and Fastlux electronic starters . JME lighting: Multipulse and Fastlux electronic starters . Arlen EFA: pulse starters . Electronic starters typically pre-heat the tube for about 2½ seconds, and then it will usually start at the first pulse. The horrible flickering of the glow-switch method is eliminated, and sputtering of the cathode material is reduced by making sure that the cathodes are at working temperature before the discharge commences. Electronic starter manufacturers claim that tube-life is greatly enhanced as a consequence, and although exact figures are hard to find, it is likely to be increased by several times (particularly in domestic environments, where people tend to switch lights on and off as they pass from rom to room). In a telephone conversation with the MD of Tabelek Ltd., the author was told that, in their tests, tubes with glow-switch starters would never last beyond 3000 starts, whereas with the Tabelek UM2 (an electronic multi-pulse soft starter) a tube will still be working perfectly after 99 999 starts (the test end-point). This appears to indicate that the electronic starter will enable the tube to last for its full cathode life ( typically ca. 10 000 hours continuous) regardless of user behaviour. The electronic starter switch is an assembly of semiconductors and other electronic components on a small PCB, and so is well-optimised for modern manufacturing methods. 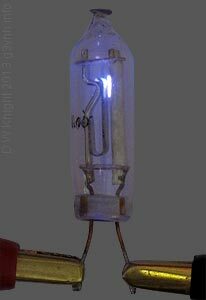 The glow-switch, on the other hand; is a primitive glass-pinch vacuum tube, produced using light-bulb manufacturing techniques that were developed around the end of the 19th Century. The latter are interesting as examples of gas-discharge technology (and they light-up prettily); but we must wonder why they are still in use, and why they are cheaper than electronic starters? A development of the glow-switch is the bypass tube. This is a bimetallic glow-switch with an additional resistive heating element. Its main use is in conjuntion with series-connected chains of discharge tubes operating from a constant-current source. If one of the tubes in the chain becomes open-circuit (due to glass breakage, etc. ), a bypass tube connected across it will strike and then close, allowing the other lamps to start. The resistive element will then heat-up and keep the bimetallic switch closed until the power is disconnected, thereby removing the dead tube from the chain. Glow-discharge running voltage: 150 V - 160 V.
Note the use of a frit base, rather than the throwback glass-pinch construction of the FL-starter glow-bottle. US Pat. No. 2200443, E C Dench, 1940, Discharge Lamp Circuit. See also US patents: 2236671, 2242902, 2247872, 2274399, 2327557, 2379131, 2449632, 2485520, 2740861, 3105889. Osram Technical Guide - Fluorescent Lamp Starters (2010).